Barring a catastrophe, Hillary Clinton's nomination is inevitable again. Barring a catastrophe, her nomination is inevitable. 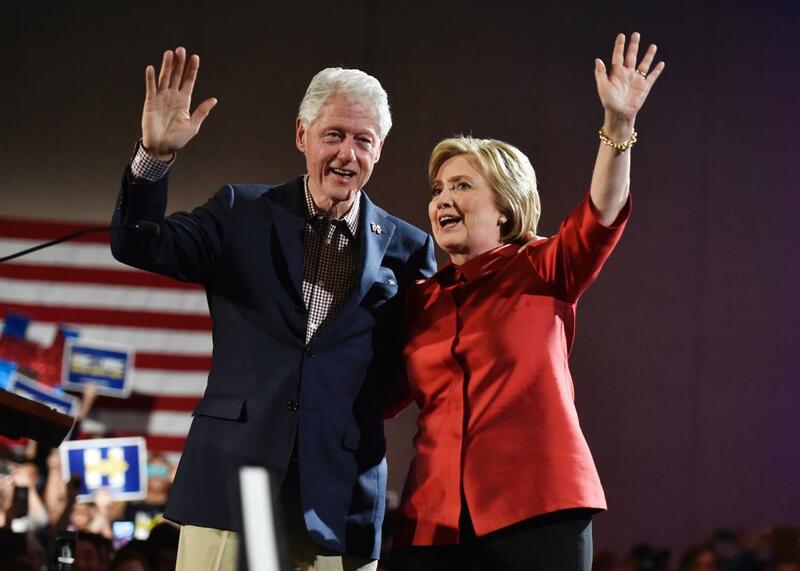 Former President Bill Clinton and presidential candidate Hillary Clinton wave to supporters in Las Vegas on Saturday. Before the New Hampshire primary earlier this month, it was assumed that the Nevada caucus was going to be a victory for Hillary Clinton. She had strong outreach to the state’s Latino and black voters; she had endorsements and support from key figures in the state; and she had her campaign manager, Robby Mook, who cut his teeth organizing the state for the first Clinton campaign in 2008, when she beat Barack Obama there. But then New Hampshire came, Bernie Sanders scored a lopsided win over Clinton, and the Vermont senator channeled that victory into an unprecedented burst of fundraising. He didn’t just have momentum—he was putting money and people into Nevada, the third state on the Democratic nominating calendar after Iowa and New Hampshire, and expanding his outreach to Latino voters. Suddenly, Nevada was in doubt. So much so that Mook issued a memo downplaying Nevada, focusing on South Carolina, and looking forward to the next swath of contests in March. By winning, Team Clinton doesn’t just score delegates—it proves its theory of the race. The Clinton campaign believes that Sanders’ strength and enthusiasm is illusory; that it reflects the peculiar demographics of Iowa and New Hampshire—rural states with few minorities—more than any pro-Bernie tide in the Democratic Party. Nevada, in other words, was a test. If Clinton lost, then it presaged a tighter race in South Carolina and beyond, and possibly one that ended with a Sanders nomination. Now, instead, we have a race that essentially looks like it did in the beginning of the year. Clinton has the advantage, and barring a catastrophic decline with black voters, she’ll march steadily to the nomination. This doesn’t mean the campaign is over. Sanders is still a formidable candidate. He will win additional contests and demonstrate the extent to which he—or at least, his ideology—is the future of the Democratic Party. To that point, Sanders continues to excel with young voters, including non-whites. In exit polls, Sanders won 68 percent of non-white voters under 45. Clinton will continue to have to respond to Sanders’ challenge and reach out to these supporters. Despite a clearer path to the nomination, she cannot be complacent. In all likelihood, this primary season will end with a Clinton who has moved even further to the left, adopting some of Sanders’ approach and even his rhetoric. And there’s still the question of turnout. Going by early returns, Nevada will be the third state where Democrats have underperformed relative to 2008. Those numbers don’t bode well for the party’s general election turnout effort, where Democrats will need to reach every possible supporter to hold onto the White House for a third term and claim a victory that would be necessary to preserve President Obama’s chief accomplishments from the last two. But the uncertainty that has defined the race since New Hampshire is over for the time being. Clinton still has her advantage with black and Latino voters, and in a Democratic primary, that is dispositive. Next is South Carolina, and there she will almost certainly score another victory, followed by wins in the Southern and Western states that follow in March. Nevada was just the win that Clinton needed. Now that she has it, her road ahead looks more stable and steady. More Slate coverage of the 2016 campaign.